"The Early Years" has only passing references to music in it. Mostly, it chronicles events in my life that are probably similar to some you experienced yourself. If you find this autobiography to be a somewhat self-indulgent, glorified account, lacking enough references to drugs and the "downside," typically inherent to a music career, so be it. I have been fortunate enough to have my life's ambition realized in great part. I have no desire to trash it in the process of sharing these stories with you. You will find it to be an accounting of experiences that I value the most in my musical life. It consists of text, pictures, memorabilia, and a few introductions to some important "musical milestone people" that I have encountered. This is not fiction; I am writing what I choose to write about. I make no claim that this is a complete accounting of events, or that you will recognize all of these people. I have, by design, left certain things out. As of late, I've had enough of rock n roll "personal war stories," although I know them to be true and can relate to them. There are those who have more impressive, higher profile stories than I have, with bigger names to "drop," due to growing up in cities known as centers of the entertainment industry. Mine was a small town, semi-rural childhood with ancestry much the same. This book is for those of you who simply wish to know me better. It doesn't represent anyone's views but my own, and is in no way meant to be construed as being affiliated with 3 Dog Night. I suppose that's as close to a disclaimer as you can get, but so be it. These are MY perspectives, not to be confused with certifiable truths, although I believe them to be so. 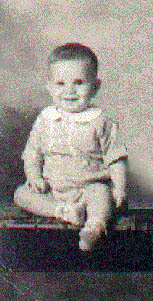 Born Michael Rand Allsup in Oakdale, CA. 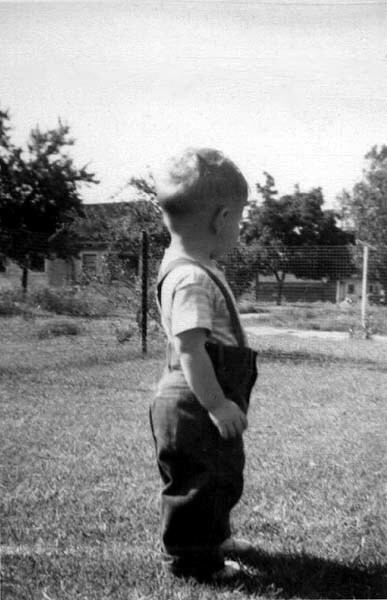 on March 8th, 1947, I was the second child of Fred and Effie Allsup, two Oklahomans that had moved west for "better pickin's" and resided in the small town of Empire, 5 miles east of Modesto, CA. One of my earliest memories was being wrapped in a blanket, lying on the back seat of our old car while stopped at the railroad crossing in Empire. The sound of the passing train and the rhythm of the wheels on the track. Clickety-clack Clickety-clack Clickety-clack Clickety-clack ... and then the rhythm would change up into a second, but slower, pattern. Cick-cack Cick-cack Cick-cack Cick-cack. Then back again. The whistle of the engine going by. Stuff of dreams ... the rhythm of the train. 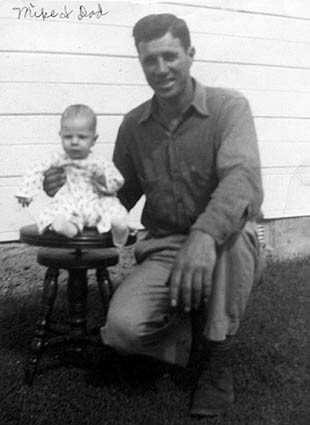 1947 - Me at approximately 4 months old with my Dad, Fred Allsup. This is "The" piano stool that I loved to spin so much when my mom wasn't playing songs. It wasn't until I was about a year or two old before I came into my own concerning the piano stool spinning technique. 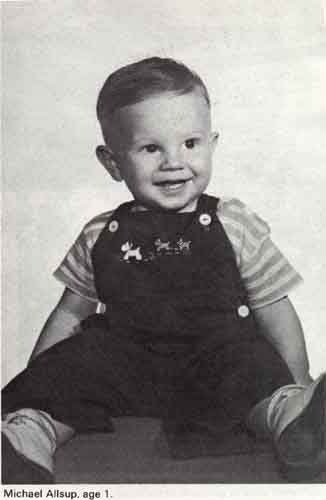 Below: Me at 7 1/2 months. When I was about 2 years old, I loved to spin the round stool of my mothers upright piano and listen when she played. Attending the Church of Christ for my entire childhood and early teens, I was reared in a Protestant denomination that used no musical instruments in the worship services. All singing was done acapella. In this environment I heard melody, I heard harmony, becoming familiar with it out of repetition. I was expected to join the singing, along with everybody else's kids, when there was singing by the entire congregation. To tell the truth, I enjoyed it a lot. Not so much as a worship thing, but for the music. I learned harmony in church, just by the exposure to it, like everyone else. Occasionally, Mom and Dad would have "singings" at our home or at some other church member's home. My dad sang bass and Mom sang alto. He would often "lead" the singing at church services, too. At the home singings it would be just adults. Usually in quartets, while the kids just played together. A number of my extended family had, and still have, music in their lives. Throughout the early and mid '50's (53-59), I heard my cousin Andy Crowe give evangelic speeches on the glory of the new music on the scene: Rock n Roll (Little Richard, Bo Diddley, Ike and Tina Turner, Elvis, James Brown and the Famous Flames. He'd take me down to the Empire drugstore and buy me a cherry coke at the soda fountain and show me Hit Parader magazine. Within that sacred magazine were lyrics to "Tutti Frutti," "Long Tall Sally," "Blue Suede Shoes," "Don't Be Cruel" and more. It was a gold mine. Dare I say it: The Bible of Rock n Roll at the time. As I recall, the covers were yellow, black and white. Come to think of it, I believe Specialty Records (The record company that Little Richard was with) had the same color scheme on his 45 rpm hits. Those drugstore trips were some kind of a "mind snapshot" for me. Andy was a musical catalyst, of sorts, for my young mind. The year 1955 brought fresh new terms like "Daddy-O" and "Cool" that permeated the older cousin's conversations. And with it came the aura that these guys were on to something. "Daddy-O" disappeared with the 50's where as "Cool" still reins today. Cool was a prerequisite in the 50's. Some things don't change. Other input came from aunts and uncles as well as Mom and Dad. My aunt, Doris (House) Allsup, in particular. Her entire family (she was one of 14 kids) were all highly musically inclined and active in it. Country music was the other style in the mix, along with Anglo-rural gospel music. My uncle, Bill Allsup played some guitar, playing chords like a country cowboy gambler would play on guitar. When I started playing, he taught me a couple of the country ballads he used to sing. Upon writing this, I realized that HE was my first introduction to guitar. A friend of his, named Rippy, played the first electric guitar I ever heard. He played really good, too. Fingerstlye with a thumb pick, kinda like Merle Travis or Chet Atkins, alternating muted bass string type things. Uncle Bill loved a record that was out at the time called "The Fool" by Sanford Clark. Matter of fact, I loved it, too. I bought the record and darn near wore it out. Uncle Bill used to sing and play it for me. That song has really stuck with me over the years. Once, in Rio Vista, California, at my cousin Andy's house, my uncle, Lowell Kuykendall showed me a song played with a one handed technique on the guitar where you hit the string and fretboard with your right hand index finger, hard enough to make it ring without picking it with your left hand. Then, before you remove your finger, you pull/slide it off the string causing a second picking of the same string, except this time it sounds the open string. Had I been a little more attentive, I would have been in on the ground floor of what Eddie Van Halen made famous years later. That is: Hammer on and Pull-off techniques. I wasn't playing yet, so maybe that's my excuse. This was about 1957. Sometimes you don't recognize opportunity even when it slaps you upside the head. About 1958, when I was 11 years old, I was influenced by my cousin, Ed Parrish who was playing guitar and singing folk and gospel music. I heard Ed sing and play the song (come down from your) "Ivory Tower." some sort of "mind snapshot." In 1999, Ed did this album and I got to help him with a little of it. (Click on the CD cover thumbnail for more info on ED) It was a real treat to get to work with him after all these years. When I was about 15, Ed's group, The Landsmen, came very close to a career in music, having a record deal and recording one album in 1962.